Unfortunately, the Impulse Technologies website (imptec.com) is no longer available (January 2018). You can download CallStation 6.0.0 from our website. To install the program follow installation wizard. CallStation is a very simple but full-featured telephone utility that implements the functions of the answering machine with possibility to receive faxes. CallStation is a TAPI compliant software and can operate with Fax Voip only via Fax Voip 14.4K TAPI Voice-Fax Modem driver. TAPI (Telephony Application Programming Interface) is a software interface developed by Intel and Microsoft that provides telephony services to applications. No needs to worry about modem initialization strings or selecting COM ports. Unlike other products, such as FaxTalk Messenger Pro or BVRP Classic Phone Tools, CallStation does not use the so-called passthrough mode when working with Voice Modems. Compared with the standard modem driver, the Fax Voip 14.4K TAPI Voice-Fax Modem driver provides support for Caller ID Number and Caller ID Name. You should not add modems using Phone and Modems option in the Windows Control Panel. To install Virtual COM Ports and associated modems open Fax Voip Control Panel, select Ports and Modems, then click <Add/Remove> button, see To Add/Remove Fax Voip Virtual COM ports. To install or reinstall modems without reinstalling Virtual COM Ports, use <Modems> button, see also To Add/Remove Fax Voip Modems. Starting with version 7.1.1 the Fax Voip program is equipped with a new TAPI compliant Fax Voip 14.4K TAPI Voice-Fax Modem driver. With this new driver voice modem functions are supported not only in the passthrough mode as it was in the previous versions, but also via standard TAPI functions. The standard Unimodem Full-Duplex Audio Device driver is automatically installed by Windows when installing modem driver. When operating using Fax Voip 14.4K TAPI Voice-Fax Modem driver via TAPI and passthrough mode is disabled, the 8-bit unsigned linear PCM at 8000 Hz format is always used. The installation of Fax Voip 14.4K TAPI Voice-Fax Modem driver also fixes the well-known playback bug with Unimodem Transform Module in Windows Vista and above (include Windows 10, both x64 and 32-bit) which prevents from playing audio through the modem to the phone line. Any telephony application that uses the modem wave driver to play audio through the modem will encounter this problem. This problem is debated for many years on Microsoft forums, but for some reasons has not been solved by Microsoft so far. Also, in Fax Voip version 7.1.1 the Hardware Hangup by detecting CD dropping from lowering DTR signal feature was implemented. This is used by CallStation and many other TAPI applications to reset the modem. Please note that after installation of Fax Voip version 8.1.1 or later, the Fax Voip modems are automatically configured for using with Windows Fax Service. 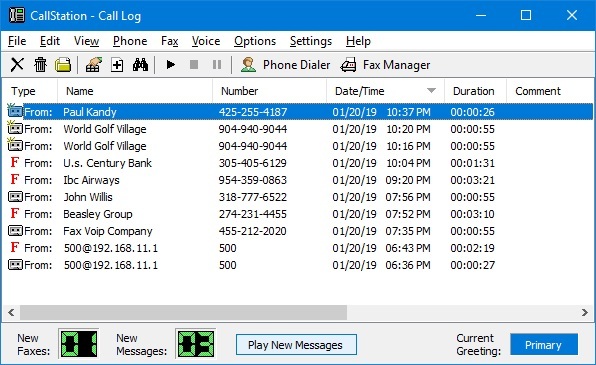 Before configuring CallStation or any other standard fax/voice software, you should manually disable sending and receiving faxes in Windows Fax and Scan (Fax Service Manager), see To configure the Windows Fax Service.